Diamond on arrival at World Horse Welfare in February, 2019. A pair of young horses recently abandoned in separate locations in Britain highlight the scale of the welfare challenges facing the country’s equines. The two youngsters had the good fortune to be spotted by passers-by and reported to international charity World Horse Welfare. 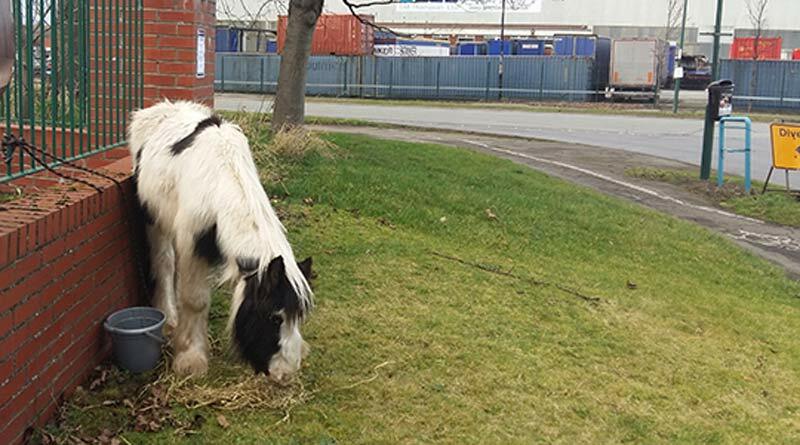 A call to the charity’s welfare line in late February alerted Field Officer Sarah Tucker to a young colt tied to railings at an industrial estate in east Middlesbrough. She found the colt, now named Diamond, extremely weak and underweight tied tightly to a fence after he had been discovered wandering the streets. Diamond when he was found, tied to a railing in an industrial area in east Middlesbrough. “Diamond was clearly only a matter of months old, far too young to be without his mother and suffering badly from poor nutrition. His bones were sticking out through his thick, fluffy coat and his demeanour was dull and lethargic,” Tucker said. As an owner could not be located, World Horse Welfare worked with the RSPCA to post an abandonment notice before transporting the colt to a safe location nearby. Diamond is now safe in the care of World Horse Welfare’s Penny Farm. Another welfare caller alerted Tucker to a second pony just a few days later after he was discovered loose in a poorly fenced field near Pontefract and close to the busy A1. She arrived to find a very weak and underweight young pony, who has since been named Quartz. Tucker was concerned Quartz would panic and get onto the motorway so enlisted the help of fellow equine charity, Bransby Horses, which brought its penning system to safely contain and catch Quartz. “Once he was in the safety of temporary boarding stables, he was assessed by a vet who found him suffering a dangerously high temperature and a severe worm infestation,” Tucker said. Quartz was found roaming in a field near Pontefract. He was scouring and was found to have a severe worm infestation and high temperature. When he was strong enough, Quartz travelled to Penny Farm, where he is doing well and growing healthier every day. “As with Diamond, no owner could be found so he is now in the care of World Horse Welfare. The plights of these two young ponies within a matter of days of each other, shows the scale of the welfare challenges facing our equine population and highlights the importance of people keeping alert for horses in need of our help,” Tucker said. Quartz has been regaining his health while in the care of Penny Farm. World Horse Welfare’s team of 16 Field Officers cover huge geographical areas, and rely on the public to be their eyes and ears. “Reporting welfare concerns is essential in helping ensure we can reach as many horses as possible and in this instance it is thanks to two callers that both Diamond and Quartz are now safe, well and ready to have sparkling futures,” Tucker said. If anyone is concerned about the welfare of a horse they can call World Horse Welfare’s welfare line on 08000 480 180. Quartz, left, and Diamond at Penny Farm.